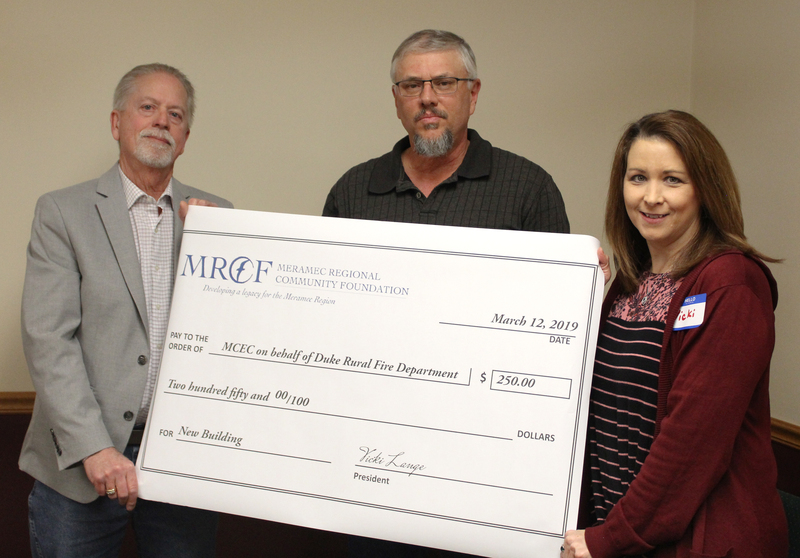 ST. JAMES—Meramec Regional Community Foundation (MRCF) awarded Meramec Community Enhancement Corporation a $250 grant for the benefit of Duke Rural Fire Department and its project to build a new building. The check was presented at MRCF’s invite-a-friend luncheon March 12 at MRPC in St. James. This year, the MRCF board reviewed a total of 18 grant applications, requesting a total of $4,414.21 and representing projects in Crawford, Dent, Maries, Osage, Phelps, Pulaski and Washington counties. The Duke Rural Fire Department was one of six projects selected for funding. Duke Rural Fire District plans to use the funds from the MRCF grant to help purchase building material. The small size of its existing structure makes it difficult for the small department to maintain and preserve its fire fighting vehicles and equipment. The new building will give the department a place to keep its vehicles under cover and better care for them, increasing response times and adding life to the vehicles currently owned. Firefighters have been delayed responding to emergencies due to weather conditions that inhibit immediate operation of vehicles. For example, the departments pumper cannot be filled in the winter due to freeze threat and must be filled prior to arriving on scene at a fire adding significantly to response time. The new station would allow the department to protect its fleet of vehicles and access them more efficiently. The Duke Rural Fire Department covers a very broad, rural area of southern Phelps and Pulaski counties – an approximately 86 square mile area. Those also wishing to contribute to the Duke Rural Fire Department’s project, can visit www.gofundme.com/duke-rural-fire-department or contact Duke Rural Fire Department Fire Chief Ron Wyatt. The Bourbon Boosters for ramps for the stage in the park. Cutline: Phelps County Associate Commissioner Gary Hicks with Meramec Community Enhancement Corporation and Ron Simpson with the Duke Rural Fire Department accept the ‘big’ check and the real check from MRCF Chair Vicki Lange.